I have received my federal approval to become Akron’s newest brewery. The timing was perfect as I am testing the brew system now with water. After exceeding the 120 day average to process applications, the Feds made good to push it through. I have to thank Brenda, the reviewer, for following up quick to get it approved a few weeks after an inquiry. Everyone at the Alcohol and Tobacco and Tax Bureau has been super nice and responsive through this whole process. After I got my Federal approval, I immediately called the State of Ohio Department of Liquor control to get an inspection. 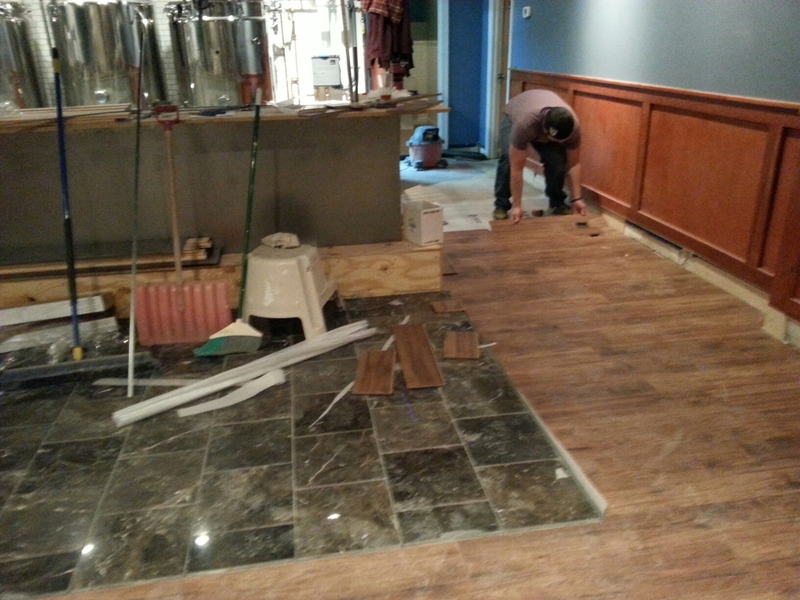 We continued on the prior weeks momentum, that is putting more flooring down and actually laying the bar top. All of the wood has been sitting for a week so it was ready-to-go. Jesse came down mid-week to knock-out the flooring. It took about three days total. My helpers helping install the transition. 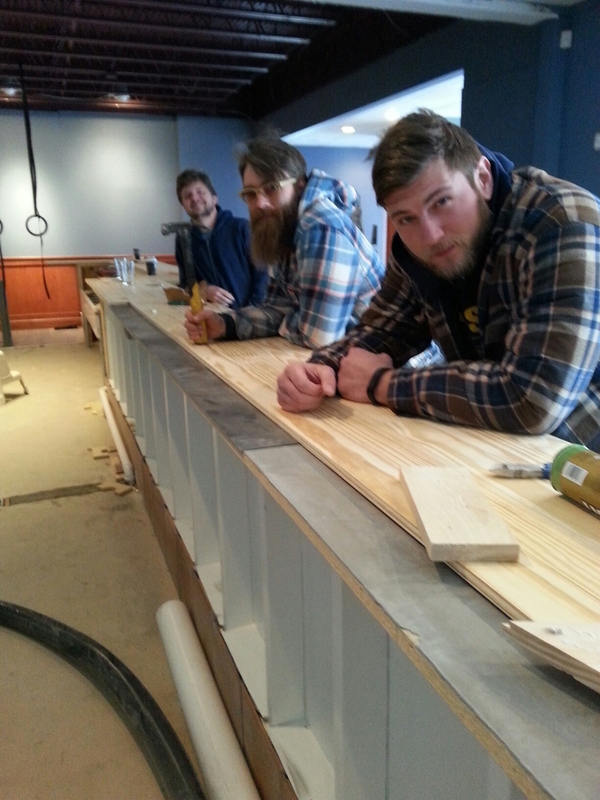 Jesse, Aaron and Stefan came down on Saturday to work on the bar top. 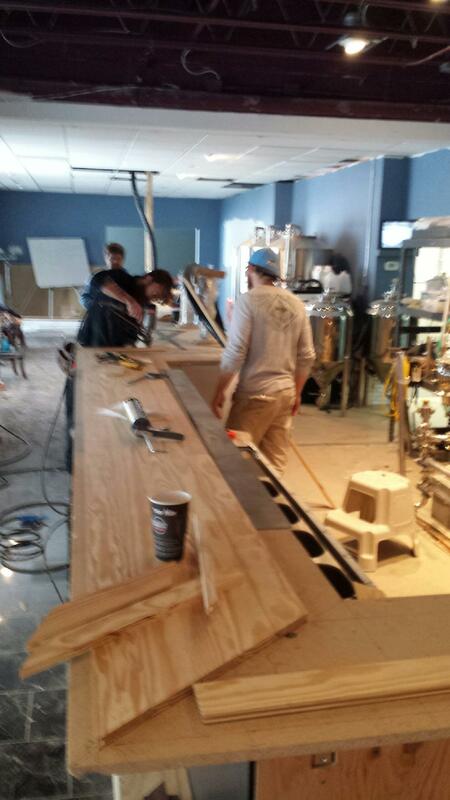 Finally, this bar may actually be finished soon. 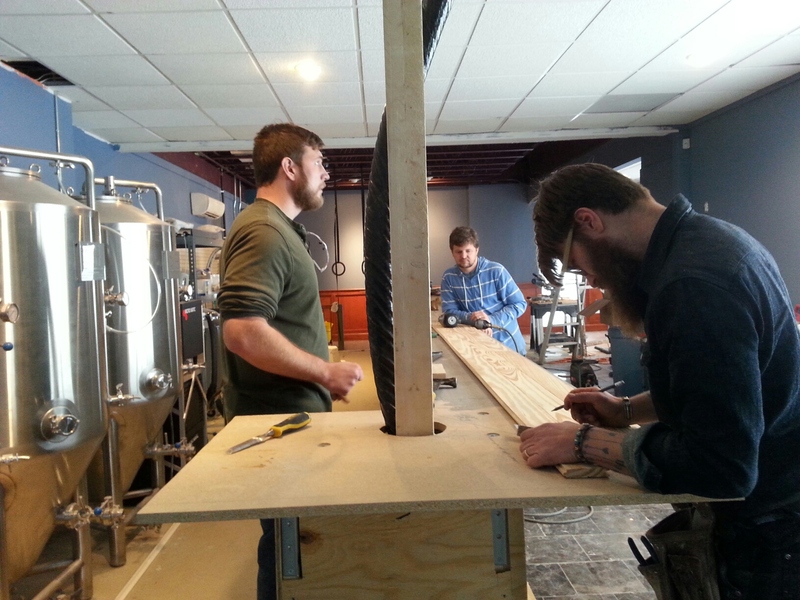 Making a bar, front and back, is a lot of work. 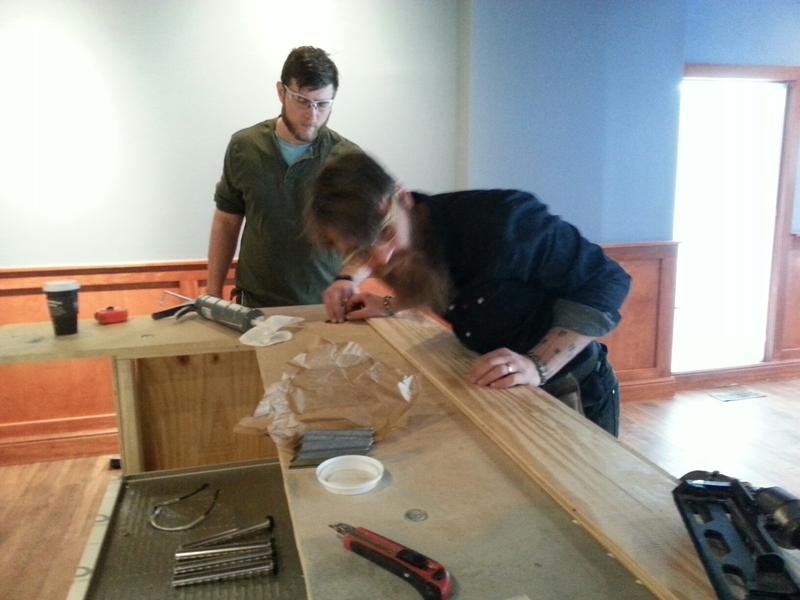 Making a 40 foot bar is a HUGE undertaking. 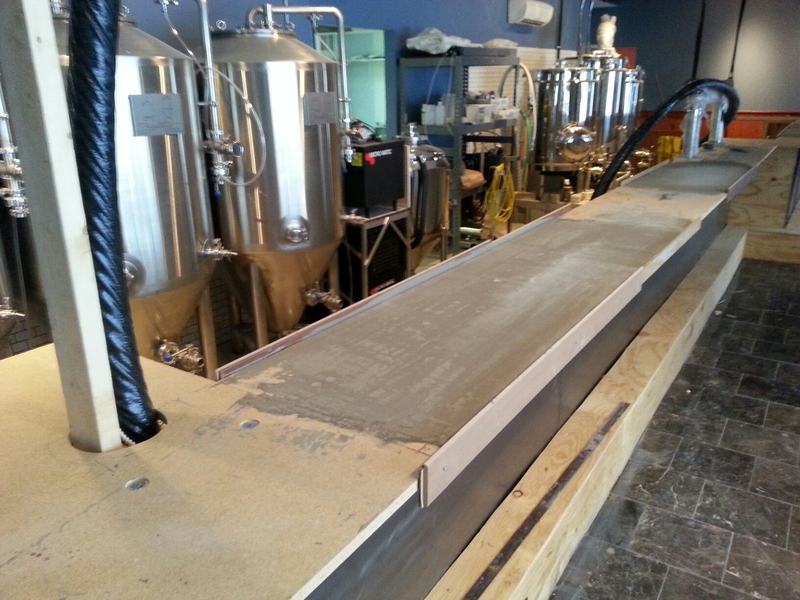 I had to first pour some leveling concrete as I there were a few dips in the bar. I did not have fun doing this. I made quite the spectacular mess. 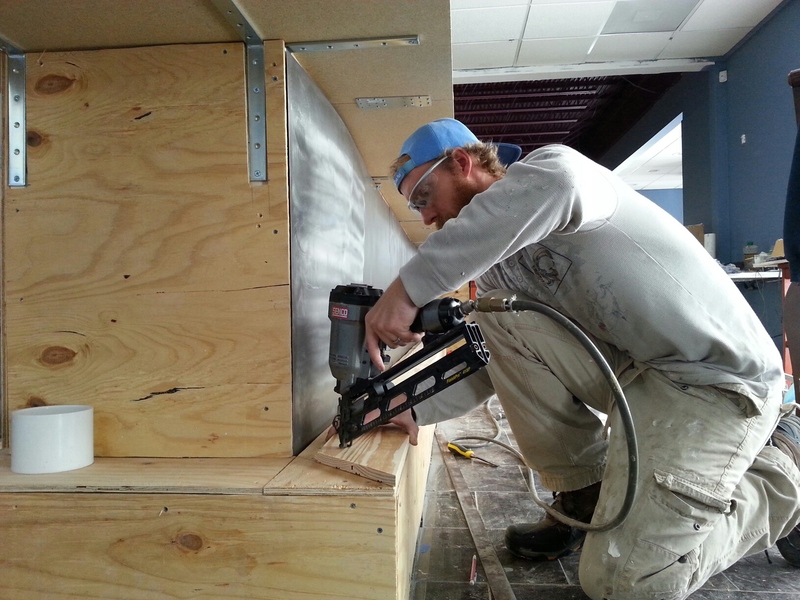 Aaron was very precise in his measurements. We’ll let you critique his joints when you saddle up to the bar for a pint! We even had to pull out SOH CAH TOA to figure out some angles. It’s been awhile since I used the inverse tangent function. See, high school geometry IS important and has practical, real-life worth. Working on the foot rests. 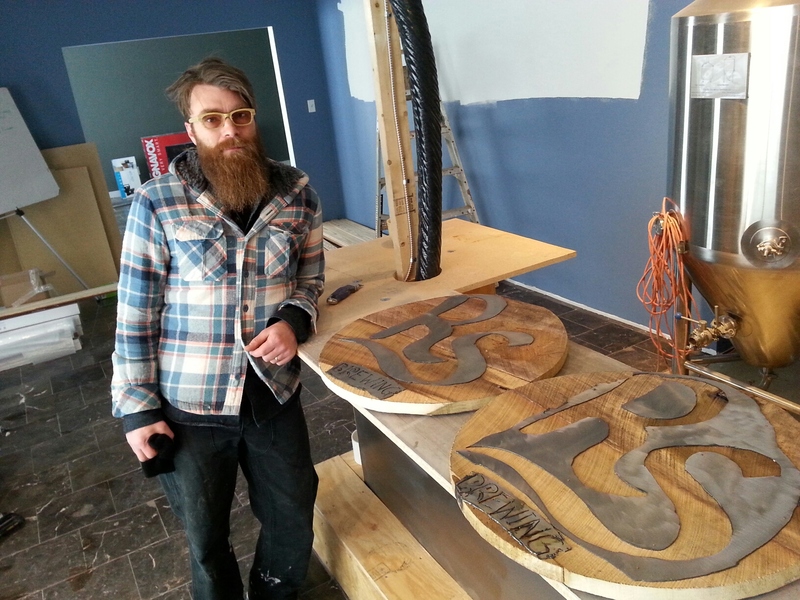 Aaron from Highland Square Restoration also brought in some medallions he worked up. These are pretty cool – kinda has a rustic, techno look – metal meets wood. This was purely his interpretation – all I supplied were the stencils. A big thanks to Aaron, Jesse, Stefan, my Dad and kids. It couldn’t have gotten done without your help. A great crew to work with. L to R: Stefan, Aaron and Jesse.